Is a $14 trillion debt tsunami really $20 trillion? Uber-style snow removal… why making money from Russian stocks is harder than it sounds… a reader’s cutting criticism (gasp! )… and more! “The Wall Street Fandango,” Bill Bonner and Addison Wiggin called it in Empire of Debt — one of the foundational books that inform everything we do at Agora Financial. Financial stocks made up 13% of the S&P 500’s market cap in 1999. Just before the onset of the financial crisis, it was 22%. Today, it’s still around 17%. And because finance’s tentacles reach into nearly every human endeavor, the effect is to disfigure those endeavors — a “great deformation,” as David Stockman titled his book in 2013. Below the headline was a commentary by author and former banker Satyajit Das — who anticipated both the Panic of 2008 and the eurozone crisis of 2010-11. He acknowledges commodities always have their ups and downs, booms and busts. But this time is different: “The downturn is exacerbated by increased financialization, which converted commodities into tradeable equivalents. And so at year’s end, we come full circle to one of our biggest forecasts at the start of 2015 — stresses in the junk bond market that will, in later years, set off the next financial collapse. That’s $9 trillion of dollar-denominated debt in emerging markets — debt issued on the assumption the global economy would stay strong and the dollar would stay weak. Add to that $5 trillion in debt issued by energy companies — debt issued on the assumption oil would trade in a range of $80-110 forever. None of those assumptions is working out as 2015 stumbles to a close. Global GDP growth is as weak as it’s been any time since the Panic of 2008. The dollar, relative to other currencies, is as strong as it’s been since 2003. And crude trades this morning at $37.61. “If default rates are only 10% — a conservative assumption — this corporate debt fiasco will be six times larger than the subprime losses in 2007,” Jim ventured to say in January. The amount of debt at risk might be even bigger than Jim said, perhaps topping $20 trillion. Back to Satyajit Das in the Financial Times: “Global lending to the energy sector alone totals around $2.5 trillion. Between 2004 and 2014, emerging-market corporate debt increased from $4 trillion to $18 trillion, much of the increase taking place since 2008. The mainstream is still pooh-poohing this $14 trillion — or $20 trillion — debt tsunami. We removed some of the annotations Deutsche Bank included in its original version of this chart. One of them pointed to the 4.2% loss in U.S. junk bonds. “The turbulence in high yield was really not a big deal when compared with the performance of other risky assets, including equities,” said the commentary accompanying the chart. Well, no. Not yet. But way back in January, Jim Rickards said he wasn’t making a near-term forecast. These things don’t take place overnight. Ditto for the “quiet” crisis of September 1998, when the Russian government defaulted on its debt — taking down the hedge fund Long Term Capital Management and nearly taking down the global financial system with it. Then, too, early signs emerged more than a year earlier when Thailand ran into trouble. “This new junk debt fiasco,” Jim said in January, “started in the summer of 2014 but will not reach its peak until 2016 or later. The guidance now is the same as it was then — make sure you don’t have junk bonds in your portfolio — including, or especially, the ones hidden in any bond funds you own. If you’re in the red, well, nothing like a little tax loss selling at year-end. If you feel adventurous, you can take a small chunk of the proceeds and put them into the recommendations of Rickards’ Intelligence Triggers — where Jim’s junk bond analysis originally appeared. His one-of-a-kind indicator takes the guesswork out of trading — showing you precise buy and sell signals. The holiday-duty Wall Street interns who pulled the major U.S. stock indexes down yesterday are pushing them up today. At last check, the S&P 500 is up nearly 1%, at 2,075. At the moment, it will be down to the wire whether the S&P ends the year slightly in the green or slightly in the red. We’re not exactly holding our breath here. Gold is steady at $1,069. Bonds are selling off, the 10-year Treasury yield at 2.27%. 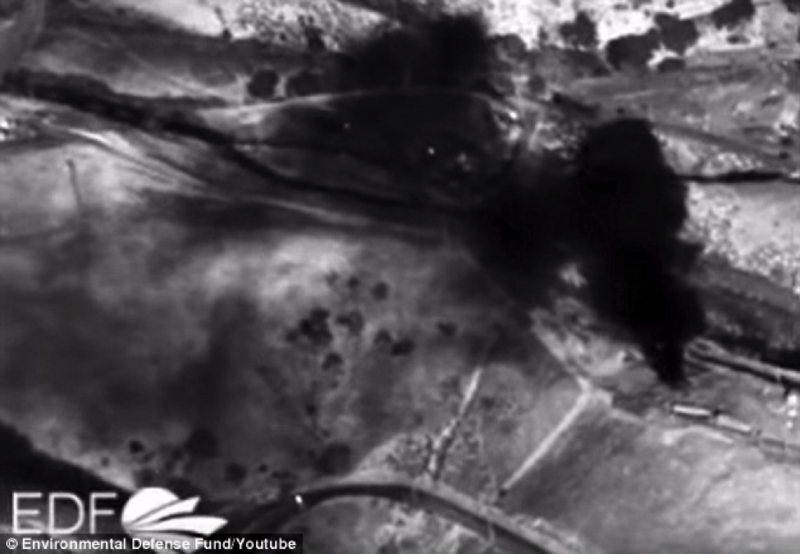 Crony capitalist outrage of the day — a geyser of methane gas spewing from a natural gas storage cavern south of Los Angeles. It’s been going on for two months, but only this week are the media outside Southern California catching onto the story — a gas leak releasing 110,000 pounds of methane every hour. More than 2,000 families have had to flee their homes. And if it’s climate change you’re worried about, methane is 25 times more potent than carbon dioxide; the amount of gas released so far equals the amount produced by all of California’s oil refineries in a year. Plugging the leak will take SoCal Gas at least three more months, in part because the base of the well sits 8,000 feet underground. Byron points out SoCal Gas’ parent company is Sempra Energy — whose board includes one Kathleen Brown. She’s an attorney, was California state Treasurer in the ’90s, is ex-Goldman Sachs… and is the sister of Gov. Jerry Brown. Presumably, her connections — er, excuse us, experience — will prove invaluable as the company contends with the many lawsuits filed by the storage cavern’s neighbors. We’d say “score one for American ingenuity,” but in this case, it’s Canadian. 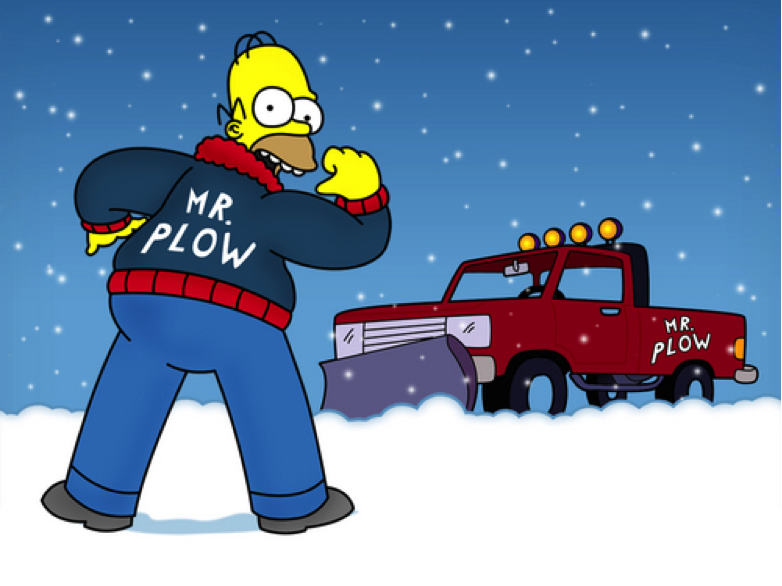 A fellow named Sean Griffith is launching what you might call the Uber of snow removal. He plans to make it available to at least six cities in the Atlantic provinces. Enter Griffith’s new business, called Plow Me Out. You sign up via website or app, answer a few questions about your driveway and you get a quote. Once you ask to be plowed out, a notification is sent to several contractors in your area. Anyway, we wish Mr. Griffith all the best. But at the risk of sounding cynical, we wonder if the snowplow biz in Canada includes any entrenched players who might give Plow Me Out the same sort of trouble Uber gets from taxi operators. “This year, I owned some shares of the IShares ETF ERUS. It closed on Dec. 31, 2014, at $11.47 and closed on Dec. 24, 2015, at $11.42. “Even after dividends, that’s a far cry from the 23.4% gain you report for ‘Russian stocks.’ Obviously, there are ‘Russian stocks’ and then there are ‘Russian stocks,’ so ‘owning ‘Russian stocks’ didn’t necessarily mean one had a good year. “How did I do well if I — as an American — invested in Russian stocks in 2015?” inquires another. The 5: Not at all. We should have been more specific — Russian stocks measured in the home currency. 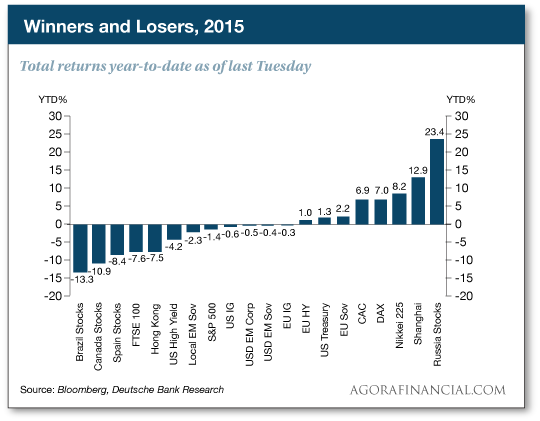 (Ditto for all the other asset classes in the chart.) Russia’s main stock index, the MICEX, started the year a touch below 1,400. As we check our screens this morning, it’s at 1,750. In theory, it would be possible to capture those gains with one of those currency-hedged ETFs. In practice, though, there’s no such product for Russia that we’re aware of. “Perhaps for Christmas, Santa will bring you some new ideas,” reads an email that filtered in just before the holidays. Then again, you might have unusually high standards, since your feedback came atop this exploration of Jim Rickards’ “Impossible Trinity” last week. You won’t find that in the paper! P.S. Can’t say we didn’t warn you: Standard & Poor’s said this month that fully half of energy junk bonds are at risk of default. By S&P’s calculations, that’s $180 billion in “distressed” debt. Jim Rickards has told us all year the dangers were building. Earlier this month, a junk bond fund collapsed — the biggest mutual fund failure since 2008. How did Jim see the trouble coming? And how can you profit from insights like these, months before they become headline news? Answers here.